Oh, and how about this is ridiculously simple to make? 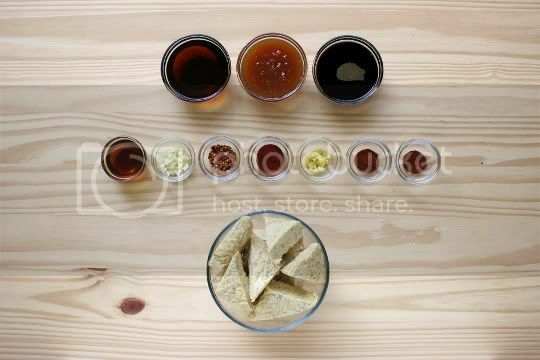 Only the brown rice syrup you may need to go search for (check Whole Foods or any natural foods market), but you've probably got all of the other ingredients. Simply mix together maple syrup, brown rice syrup, soy sauce, sesame oil, fresh garlic and ginger, red pepper flakes, paprika, chili powder, and a little cayenne. The recipe says to add water to the marinade, but I didn't really see the point (considering I wanted this to be a thick, sticky glaze), so I'd say it's not necessary. Cut the tempeh in whatever shapes you'd like. I cut mine a little smaller than the recipe suggested (6 triangles per tempeh, as opposed to 4). 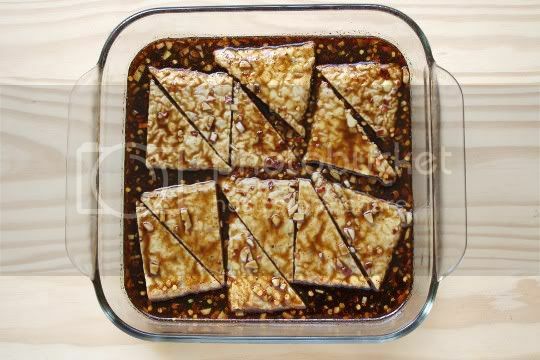 To do this, simply cut the tempeh width-wise in thirds, then cut each square diagonally. Easy and precise! 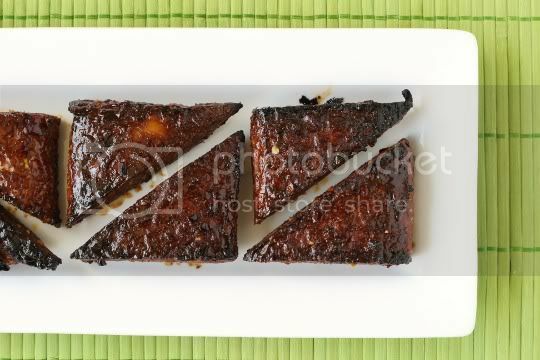 I marinated my triangles in the mixture for about 12 hours, turning every few hours or so. 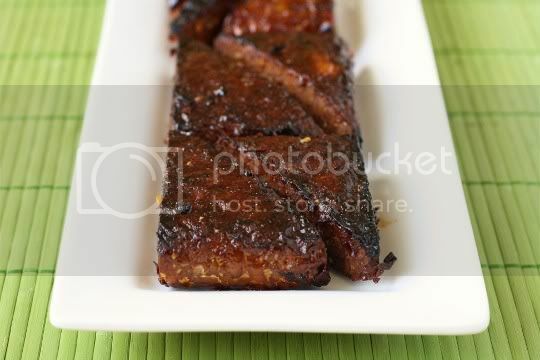 This allows the marinade to really be absorbed by the tempeh (by the way, do NOT get rid of the marinade). After marinating, I broiled the tempeh for about 5 minutes on each side. Broil it long enough that it starts to blacken on the edges and turn a deep, rich brown, and brush with additional marinade if you want. Oh yes. That dark, rich, mahogany glaze you see is everything you're imagining: sweet and savory, salty and spicy, thick and sticky. There's a subtle roasted flavor from the sesame oil, and a nutty, malted flavor from the brown rice syrup, which nicely complements the bitter nuttiness of the tempeh. 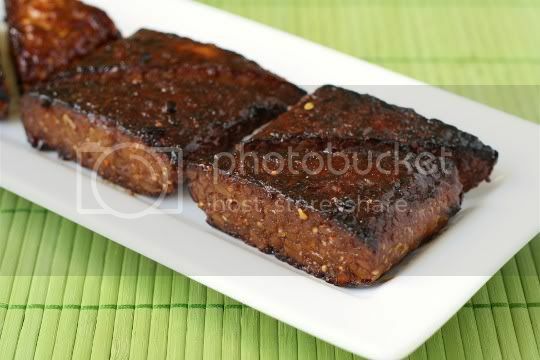 The tempeh itself is thick and chewy, with crispy caramelized edges from the broiling. It does retain some of its sour flavor, but the flavorful marinade consumes most of that. Just two to three of these triangles are surprisingly hearty, so much so that I strongly recommend you serving them on a bed of sauteed greens or with some other green, leafy vegetable. I was originally planning on serving mine with rice, but one bite of the hearty tempeh and I knew that would be a mistake. The tempeh would also be amazing sliced thinly and served in a sandwich, especially with a little sriracha mayo and shredded cabbage. Yum! Make again? Definitely. A super flavorful and delicious marinade makes an iffy ingredient come to life! I'd also try this marinade with tofu, seitan, or any other faux meat. Mmmmm! That look just scrumptious. I do something similar, but I use Agave instead of maple syrup, brown rice syrup. You can also use firm tofu instead of tempeh. It is so good! that looks delicious! oh! and boiling the tempeh for like, ten minutes before preparing it gets rid of that bitter taste.